Reached an agreement with energy companies on the gradual shut down of the 19 nuclear power plants → enacted as the Nuclear Exit Law. 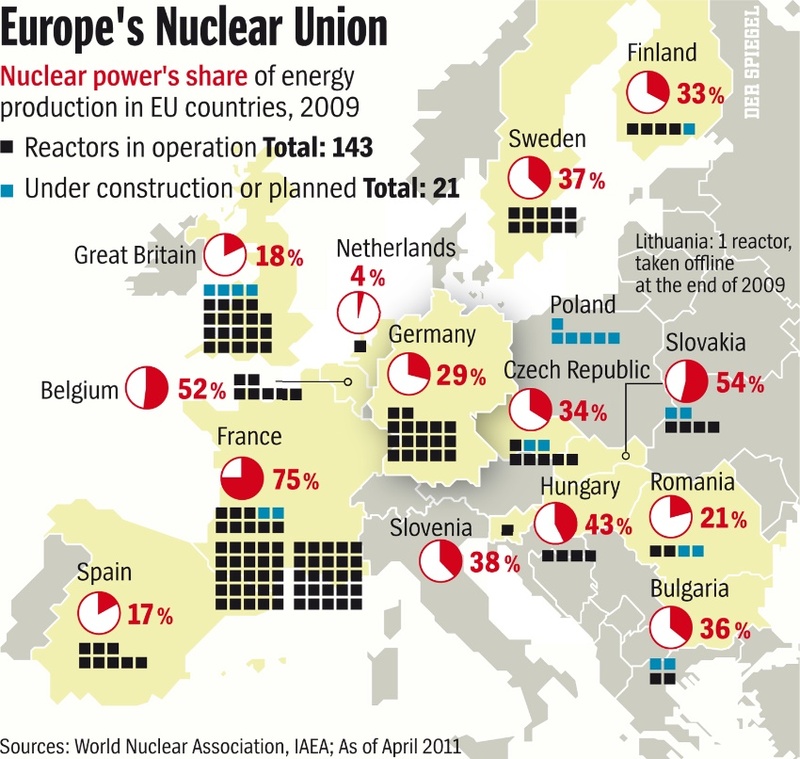 Based on the calculation of 32 years as the usual time of operation for a nuclear power plant. Two power plants were turned off in 2003 and 2005. Phase-out plan was delayed in late 2010, when during the chancellorship of Angela Merkel the conservative-liberal government decreed a 12-year delay of the schedule. It provoked protests. On 14 March 2011, in response to the incident – and in light of upcoming elections in three German states, Merkel declared a 3-months moratorium on the reactor lifespan extension passed in 2010. 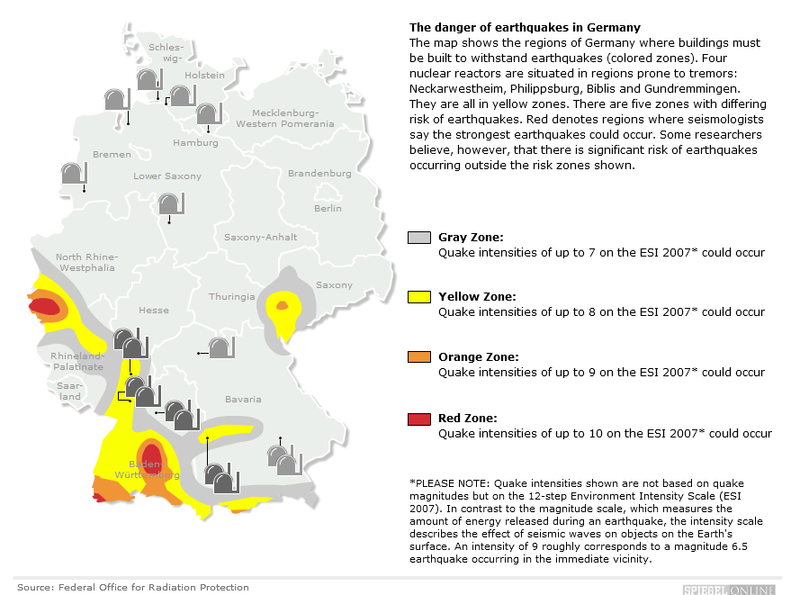 On 30 May 2011, the German government announced a plan to shut all nuclear reactors by 2022. 8 oldest, which are already offline will not resume operation. One plant will be kept in “standby” mode as a reserve when needed on cold, gray winter days (little solar energy and neighboring countries have a little for export). Merkel stated that Germany “[does not] only want to renounce nuclear energy by 2022, we also want to reduce our CO2 emissions by 40 percent and double our share of renewable energies, from about 17 percent today to then 35 percent”. Increased investment in natural gas plants would provide a backup to ensure consistency for those times when the solar, wind and hydroelectric sources did not meet demand. To make up the shortfall, power moves from wind parks in the north to the south. It requires transmission along neighboring grids in Poland and the Czech Republic because its own system lacks the capacity. That leaves those grids at risk because they were built at least 30 years ago to handle domestic demand. The German system needs about 10 billion euros ($14.3 billion) of upgrades by 2020 to stop using neighboring networks. Director of International Energy Agency (IEA) Nobuo Tanaka warned Germany: dropping nuclear power is threat to European energy security. 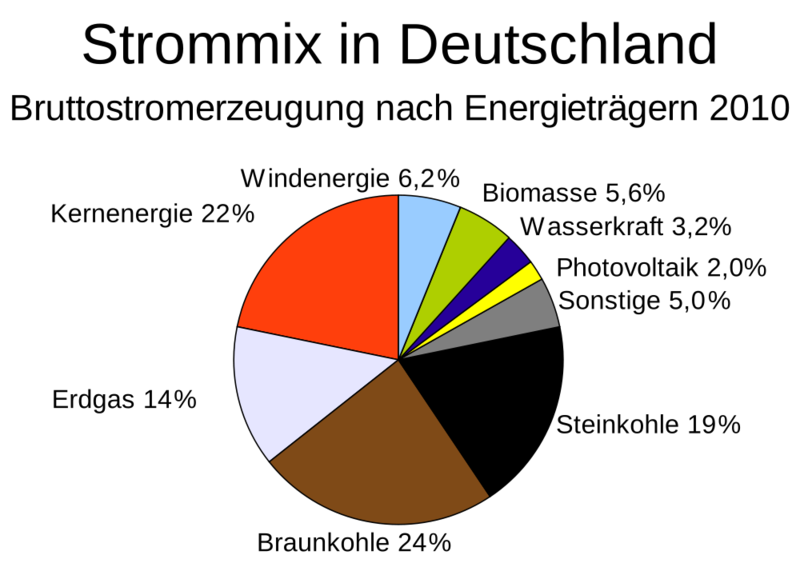 Result of phase-out would be higher import of energy, but also higher consumption of gas and coal, which will damage Germany’s energy security. 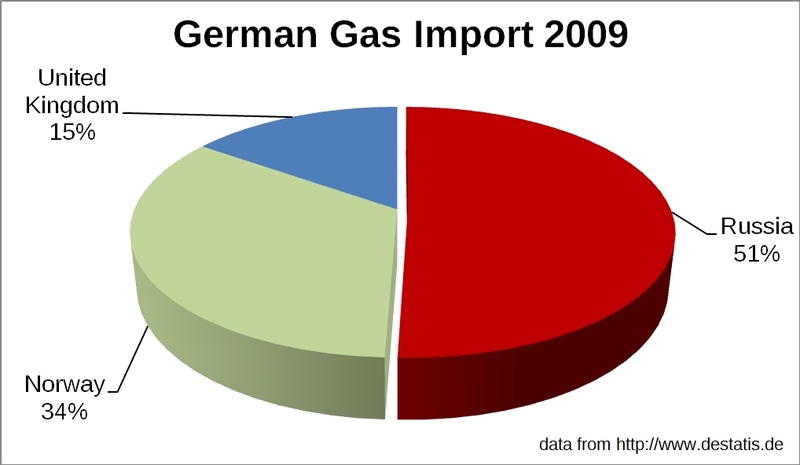 Deutsche Bank report said: Germany will be a net importer of about 4 terawatt hours (TW·h) of power in 2011 after exporting 14 TW·h last year. In April RWE took legal action against the nuclear power moratorium. E.ON AG lodged a constitutional complaint alleging an infringement of its fundamental rights due to the uncompensated shut down of some of its nuclear power plants under a 3 Month Moratorium and the accelerated nuclear power phase-out. In Germany: conservative (Die Welt) is against, center-right (FFA) criticizes, center-left (SDZ) not just phase out but process; leftist (TS) is for. The Economist: Mrs Merkel’s shift was already under way. 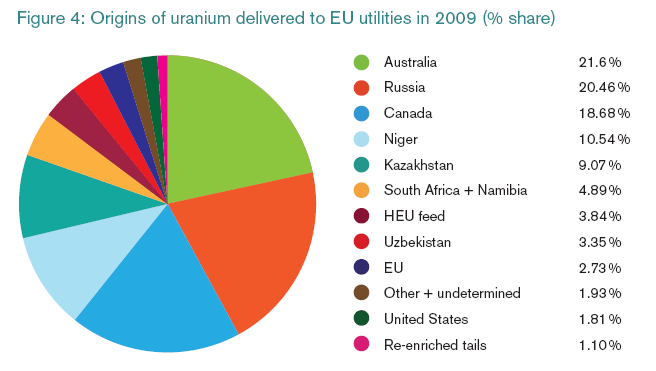 In 2000 30% of electricity came from nuclear. Since then, renewables like solar and wind have expanded their share from 6.6% to 16.5%. When cheap and plentiful gas replaces coal in electricity generation, it often reduces emissions much more cheaply than renewables can. But when gas replaces nuclear, it increases emissions. Germany will emit an extra 370m tonnes of CO2 as it replaces nuclear with gas- and coal-fired plants. Of the 3,500km (2,175 miles) of transmission lines that are needed to carry renewable power from (largely northern) sources to southern and western consumers, just 90km have been built. “Monster masts” provoke almost as much opposition as nuclear reactors. In 2005 German chancelor Gerhard Schröder (in 2006 became chairman of the Nord Stream consortium) and Russian president Vladimir Putin announced plan to built North Stream. Natural offshore gas pipeline from Vyborg in Russia to Greifswald in Germany placed on bottom of the Baltic sea. When fully operational in 2013, Nord Stream will carry some 55bn cubic metres of gas – enough for 26m households – into Germany, from where it will be piped to the Netherlands, Denmark, France and the UK. That compares with an export capacity of 150bn cubic metres annually for Ukraine, Russia’s principal supply line to the EU. About 80 per cent of Gazprom’s supplies to western Europe currently pass through Ukraine. 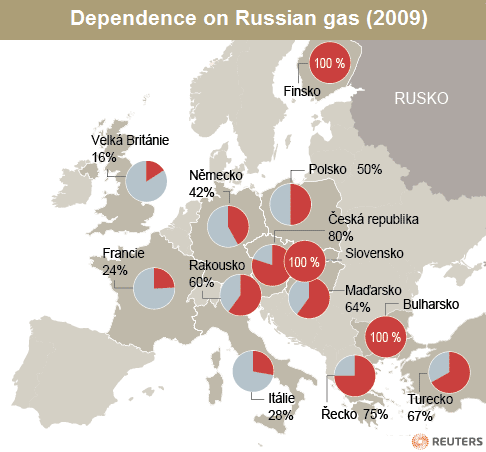 But 64% of Russian export consists of oil and gas. About 60% of profit from exports to EU goes to Russian state budget. Profit from gas export creates about 6% of GDP. Nabucco supported by Gerhardt Schröder’s former foreign minister Joschka Fisher is owned by Austrian OMV, Hungarian MOL, German RWE, Bulgarian Bulgargaz, Rumanian Transgaz a Botas from Turkey. It should be operational 2017, but Russian South Stream already in 2015. The Economist (When the steam clears, Nuclear? Nein, danke); www.spiegel.de (Germany to Phase Out Nuclear Power by 2022, Nuclear Phaseout Is an ‘Historic Moment’, Utilities Could Block Merkel’s Energy Revolution), atominfo.cz (Šéf Mezinárodní energetické agentury varuje Německo před odklonem od jádra), www.germanenergyblog.de (E.ON Lodges Constitutional Complaint Against Shutdown of Nuclear Power Plants); www.amo.cz (Nord Stream zahájen. Cesta k energetické bezpečnosti EU také? ), ihned.cz (Nabucco plánuje dokončení na rok 2017. 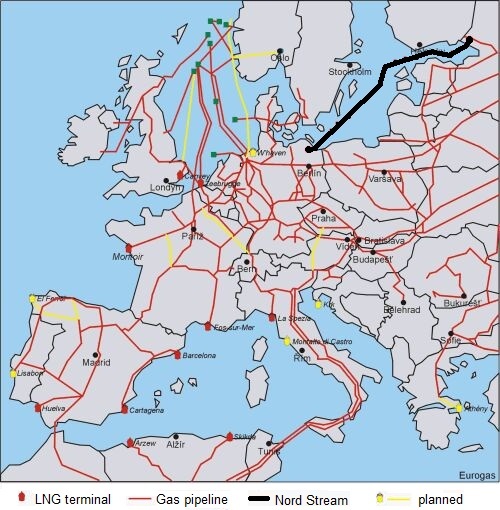 South Stream však bude fungovat o dva roky dříve), www.ft.com (Russia-EU gas pipeline delivers first supplies); en.wikipedia.org (Nuclear power in Germany, International reaction to the Fukushima Daiichi nuclear disaster, Nuclear phase-out #Germany, Nord Stream). K té naší diskuzi o kořenech obav z jaderné energie v Německu (ale i některých dalších zemích) – tady jen pro informaci posílám odkaz na instruktážní film, který natočila americká armáda v letech 1956-1957 a který odráží, že i USA měly tehdy obavy a pochybnosti o případném výsledku jaderné války a o morálních aspektech využití jaderných zbraní (i když ve fimu nakonec USA pochopitelně vyhrají) – http://www.gwu.edu/~nsarchiv/nukevault/ebb336/index.htm.